Welcome to French For Pineapple to any new readers that have come my way via the The Ordinary Lovely (thanks Rachel!) 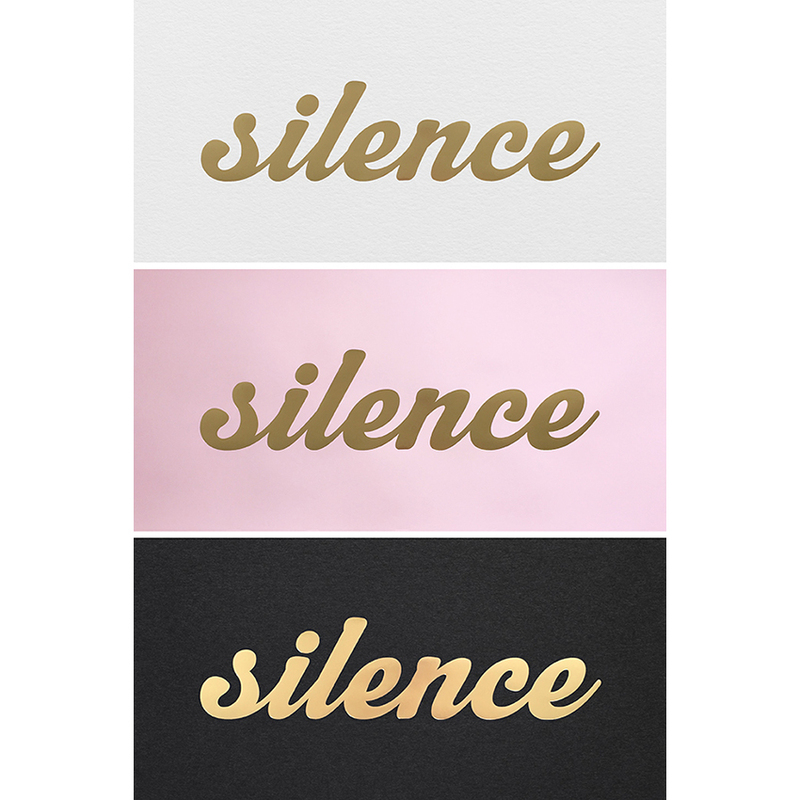 for the #UKHomeBlogHop! I'm excited to be taking part in this years first UK interiors blog hop, organised by our gorgeous host Kimberly, from Swoon Worthy. 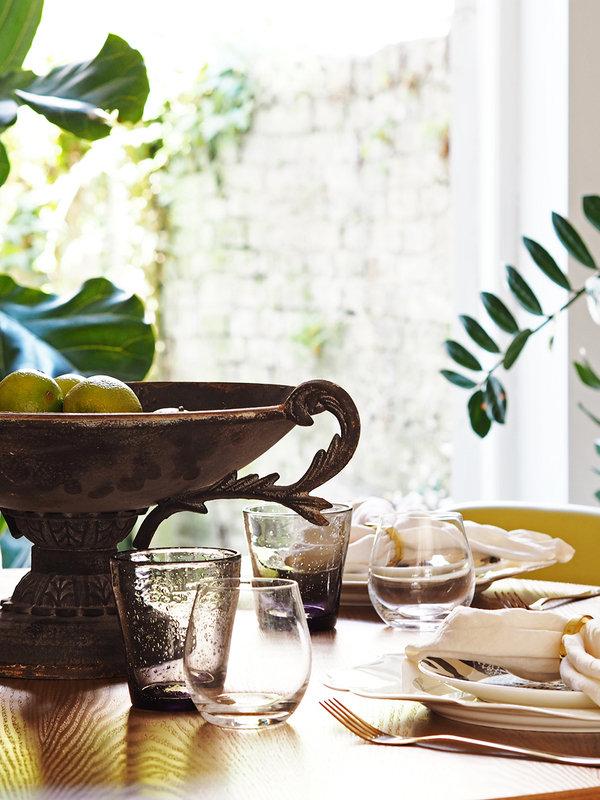 I'm Bianca Hall, an interiors obsessive, writer and designer. French For Pineapple is where I share my room makeover plans and reveals, products I'm currently obsessed with, and everything in between, as long as it's interiors related. If you're a regular reader, and not aware of the hop, do pop over to Kimberly's blog where the trail begins. 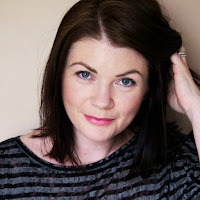 There are 27 blogs taking part over the week, and it's really rather fun to follow the hop and see all the bloggers different styles - in this instance we're all sharing our Summer Style. 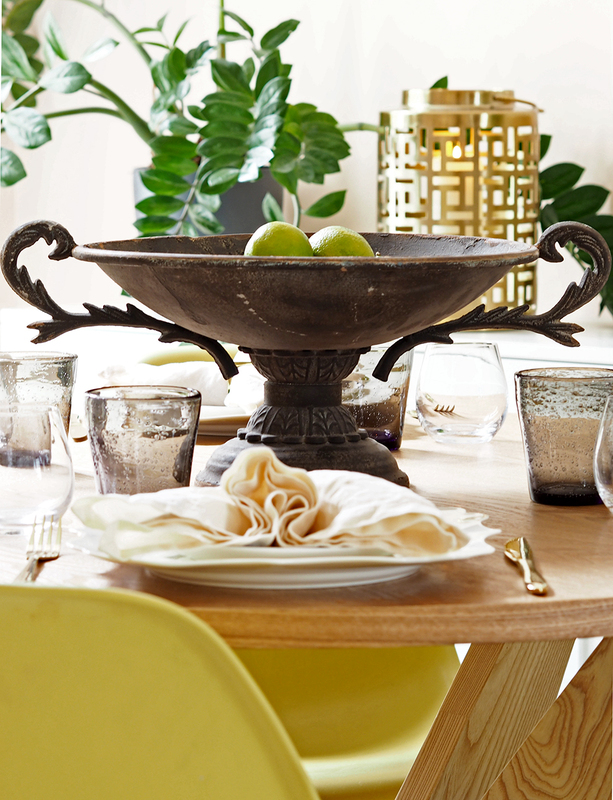 So without further ado, I'm sharing my new look summer dining room with you today. I found that we were using our dining room less and less, despite the fact that I'd made a concerted effort not to leave our dining table covered with stuff all the time (just me?). 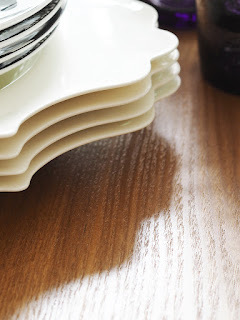 We were still crowding around the kitchen table for most meals, and I'm not sure I'll ever understand this common phenomenon, but I really wanted to make our dining room more inviting. And more, well, used! I convinced my husband that the stainless steel clad table needed to go to another home, because I really felt that a round (or oval) table would work so much better in this space. He finally agreed, and now we have a lovely round wooden table, which not only feels lighter in the space, but helps with the flow between the living and dining rooms. The stainless steel always felt cold and uninviting to me, and the wood has instantly changed the feel of the room, warming it up and making it much more inviting. 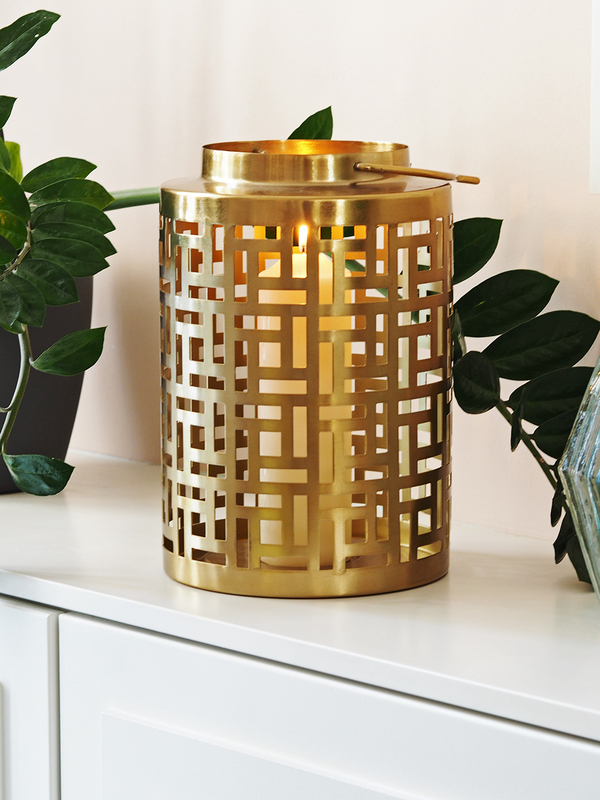 Lighting is of course an important part of creating the right atmosphere, and I fell in love with this brass Deco Lantern from Marks & Spencer. It's solid brass and really substantial at over 30cms tall. It's looks great, glowing away with one large pillar candle in it on the sideboard, and I'll also be getting lots of use from this outside on warm evenings. In fact, I probably need another one or two so I can dot them around the garden - they're SO pretty. 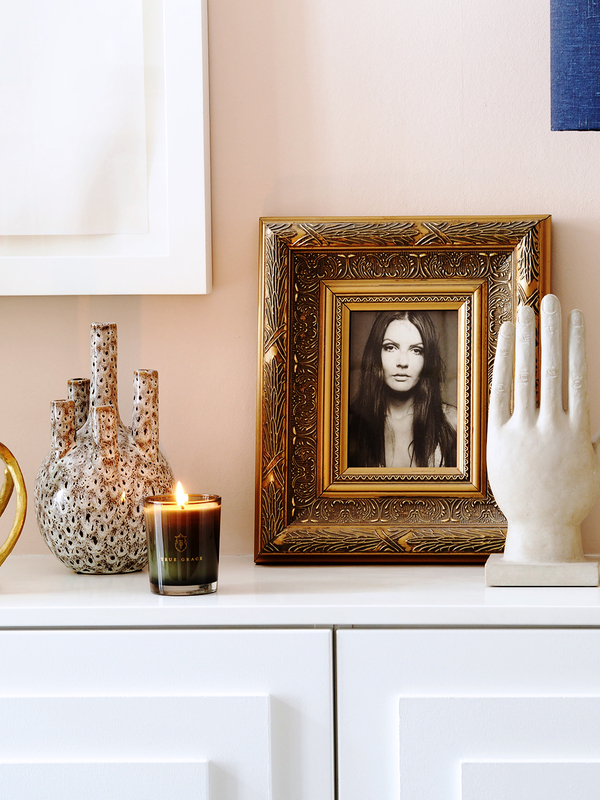 Scent is another important element to set the mood, and scented candles are an essential of mine. Sweetpea & Willow have a great selection (among many, many other beautiful homewares - if you don't know them, do check them out!) to help get the mood spot on, and I've gone for a True Grace candle in Portobello Oud, the perfect exotic scent for balmy summer evenings. 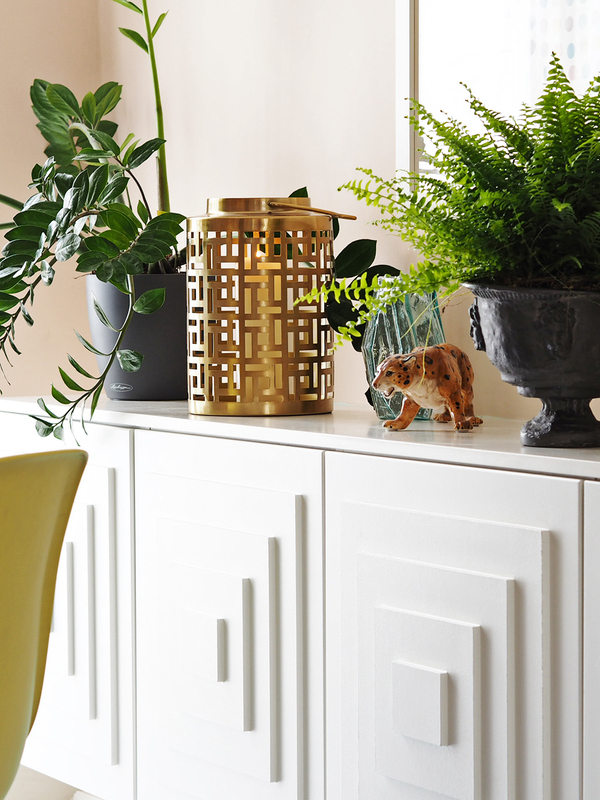 Another new addition to the sideboard is this amazing urn planter from Wayfair. 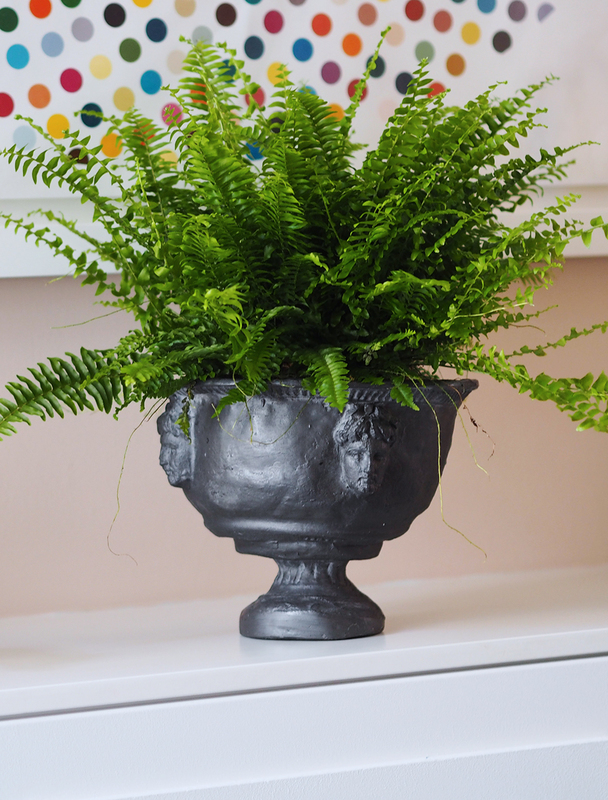 I've always loved a Boston fern in an urn, and I'm really going to try my best to keep this one alive. Apparently it's all about keeping it moist but not wet, with lots of spritzing. This is definitely where I've gone wrong in the past, so pray for this one, that it doesn't become yet another of my fern victims. Ditch the table cloth (it'll only get stained), but do use crumpled linen napkins. 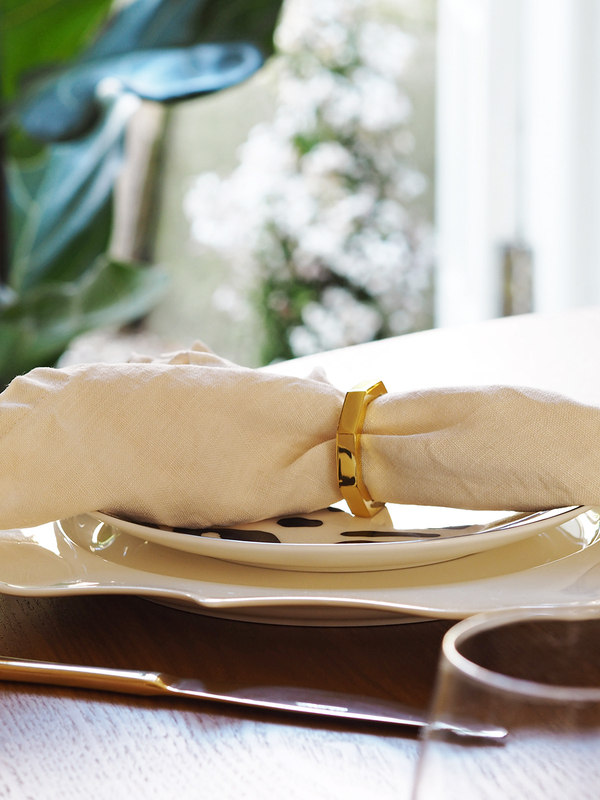 Ditch the excess cutlery (it'll only mean more washing up), but do use pretty napkin rings. 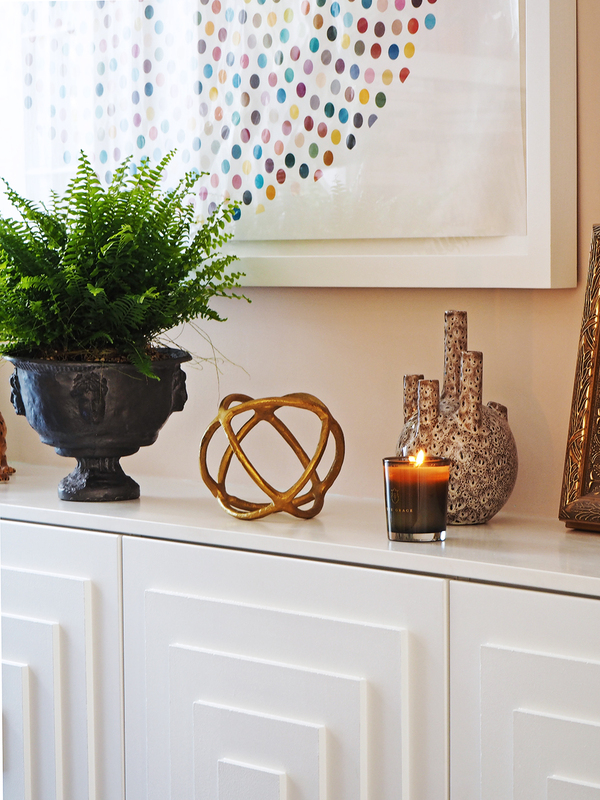 Ditch the fussy flower arrangements (seriously, who has the time?! 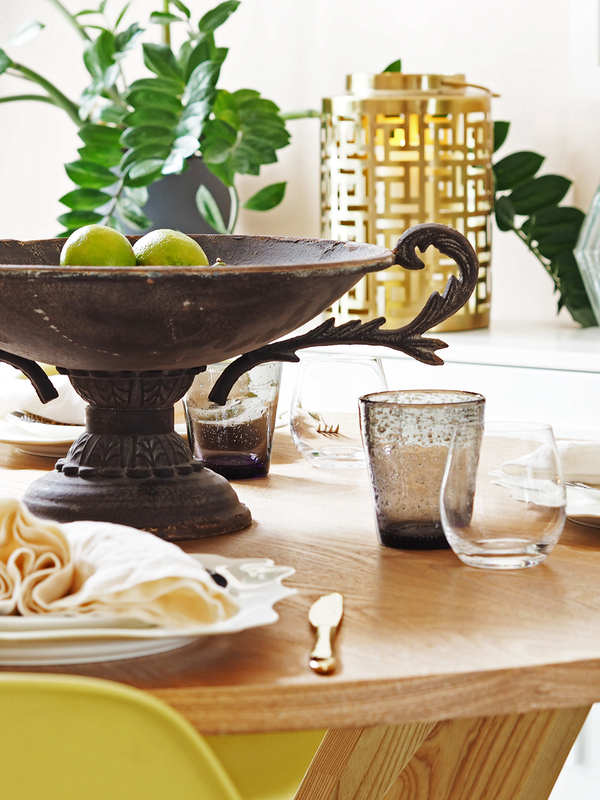 ), but do go for either a messy loose arrangement in a low vase, or a footed bowl filled with a single kind of fruit. Catch my drift? 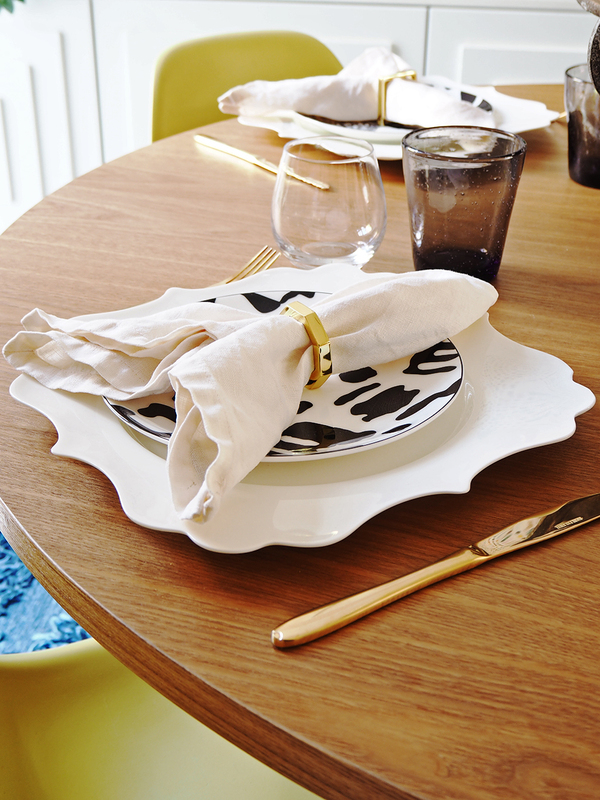 So basically, don't go super informal with just simple plates and cutlery - dress the table up with an interesting mix of plates and accessories, but keep it fun and informally-formal! I also like to swap stemmed glasses for stemless ones at the table for less chance of spillage (these ones are from LSA, and the tinted tumblers are from Neptune). 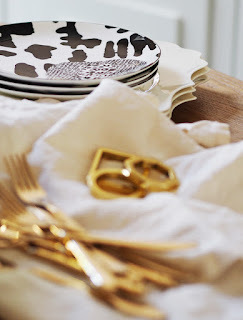 I love the new Toulouse dinner plates from Marks & Spencer (coming soon from the AW17 collection), and paired them with the Sue Timney for Marks & Spencer Camouflage side plates (available now). This is a great pairing, that stops the scalloped shape of the Toulouse plates feeling too traditional and gives them a modern, fun edge. 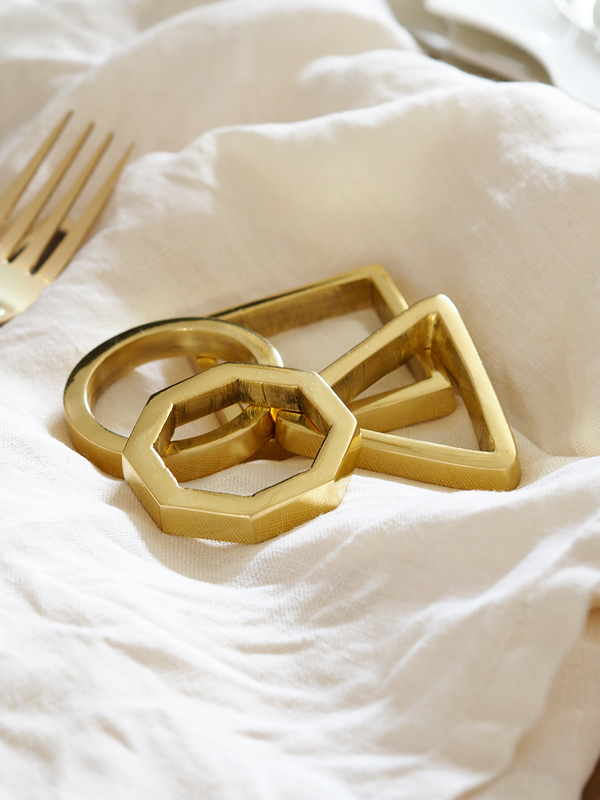 And what's not to love about the solid brass geometric napkin rings? They're also from Marks & Spencer and available now - a set (only £15 so be quick before they sell out) includes a square, octagon, round and triangular ring, and I love them so. 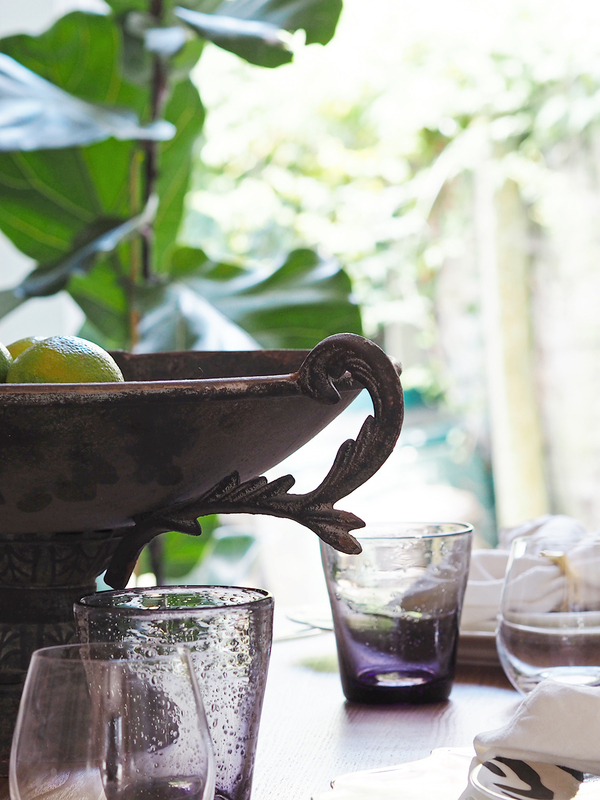 I've piled limes into this fab footed bowl, also from Wayfair, which makes a lovely centrepiece. We go through a load of limes in the summer months - lime juice is great in dressings, it's an essential for asian dishes, and they're obviously a staple cocktail ingredient for Mojitos, and a G&T isn't really a proper G&T without a wedge of lime squeezed into it. So yes, they are very much practical as well as decorative. We've actually started eating at the new dining table rather than the kitchen table, and I just love the new look in here. Long may that continue! 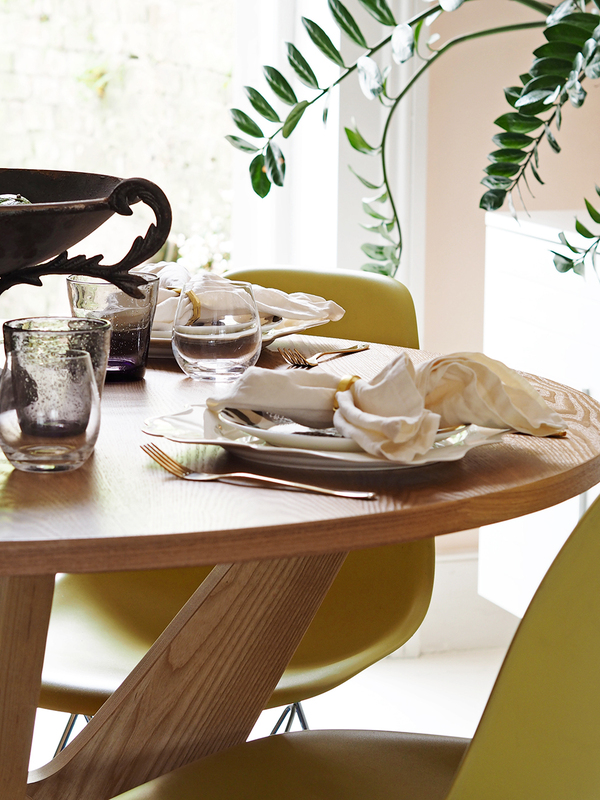 I hope you like my new summery dining room, let me know what you think in the comments, and please hop on over now to see what the lovely Carole from Dear Designer has in store for you, and make sure you follow on with the hop for the rest of the week! I'll be adding all the links below each day. And a big thanks to my sponsors Marks & Spencer, Wayfair and Sweetpea & Willow. Beautiful photos as always! Everything looks so dreamy and summery! Just found your blog via the blog hop. I feel a bit like a weirdo commenting around, but hey, you got a new reader! I hope that fern lasts. I'm a professional fern killer, so I gave up on them long time ago. Also, thank you for the practical no-fuss tips for the dinning table: no tablecloth or stemmed glasses. Makes life easier! Hey Juan! Don't be silly - that's what the comments are for, so thanks for joining in! Yeah, I have my doubts about the fern lasting more than a month, I give up on them temporarily after every death, but I just love them so much I always go back for more! 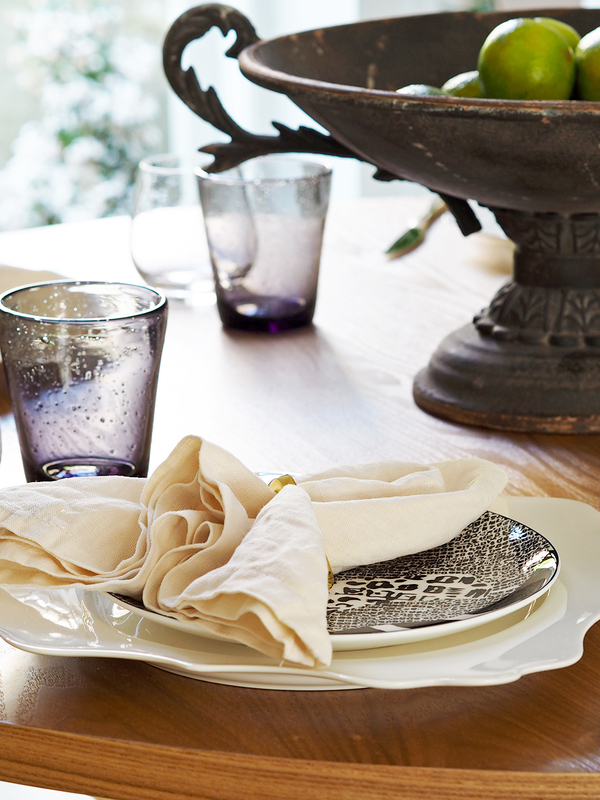 This looks so welcoming, and I love the shape of those plates! So nice to have something other than circles or squares. Great post! I love the setting on the table, it looks simple and stylish. 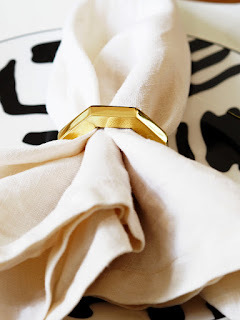 Those napkin rings are gorgeous! I also love the colour of your chairs. A really nice pop of colour! Looks really great. Love your choice of table. Dining rooms are funny old things. It's easy not to use them if you have a table in the kitchen. I wish I had a dining room. Yours has made me really envious, in a good way of course. I hope the changes you've made mean that you'll use it more now. Thanks so much Stacey! Our dining room was in danger of becoming a permanent large thoroughfare - such a waste of space. We're going to dine there every night now! Bianca this is sooo beautiful, but I have to say I am totally head over heels in love with your rug! Thanks so much! Yeah, I reckon you should reclaim it from the pets - ours had become an expensive thoroughfare! Looks beautiful....that table is stunning! I love all the summer accents in this room and I'm still madly in love with your DIY sideboard! Oh I love the bit on your sideboard!! What a gorgeous room to eat in, M&s are doing fab homewares right now!